We’re always looking for real weddings to feature in A Grand Wedding magazine. Please submit the following information if you’d like us to consider yours. Wedding submissions can be completed via the form below or can be sent to Rebecca at Rebeccam@tetonmediaworks.com. What advice do you have for couples planning a Teton wedding? Please type the letters from this image. Please note: By submitting your story, you give A Grand Wedding permission to edit for tone, length, grammar, and clarity. 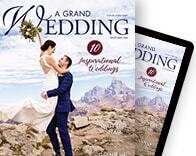 We require first-publication rights and are unable to feature weddings that have already been published in other magazines, websites, or blogs. You will be contacted in the month of October if we select your story for the magazine.